Keeping Boston Safe: At about 7:30am, on Saturday, April 13, 2019, members of the District E-13 and District A-7 Neighborhood Drug Control Units executed a search warrant in the area of 91 Esmond Street in Dorchester. As a result of the search, officers were able to discover and recover a firearm, described as an army green-colored Taurus 9mm firearm (see photo), and illegal drugs. Additionally, officers arrested Anthony Kelley, 39, of Dorchester and charged him with the Unlawful Possession of a Firearm, Unlawful Possession of Ammunition, Carrying a Loaded Firearm on a Public Way and Possession With Intent to Distribute a Class B Drug (Crack Cocaine). Mr. Kelley is scheduled to be arraigned in Dorchester District Court on Tuesday, April 16, 2019. Keeping Boston Safe: At about 6:30 PM on Monday, February 25, 2019, members of the Youth Violence Strike Force, District C-11 (Dorchester) Drug Control Unit, and agents assigned to the ATF executed a search warrant in the area of 5 Salisbury Park in Dorchester and 1 Aspinwall Road in Dorchester. As a result of the search warrant, officers recovered a silver Taurus .38 Special Revolver loaded with five rounds of live ammunition, a black Smith and Wesson Revolver loaded with five rounds of live ammunition, approximately 17 grams of Fentanyl, 4 grams of cocaine, and an undisclosed amount of US Currency. Officers arrested Raymond Clary, 29-years-old, of Dorchester. Clary is expected to be arraigned in Dorchester District Court on charges of Unlawful Possession of a Firearm Subsequent Offense, Unlawful Possession of Ammunition, Trafficking Fentanyl over 10 Grams, and Possession with Intent to Distribute Cocaine. 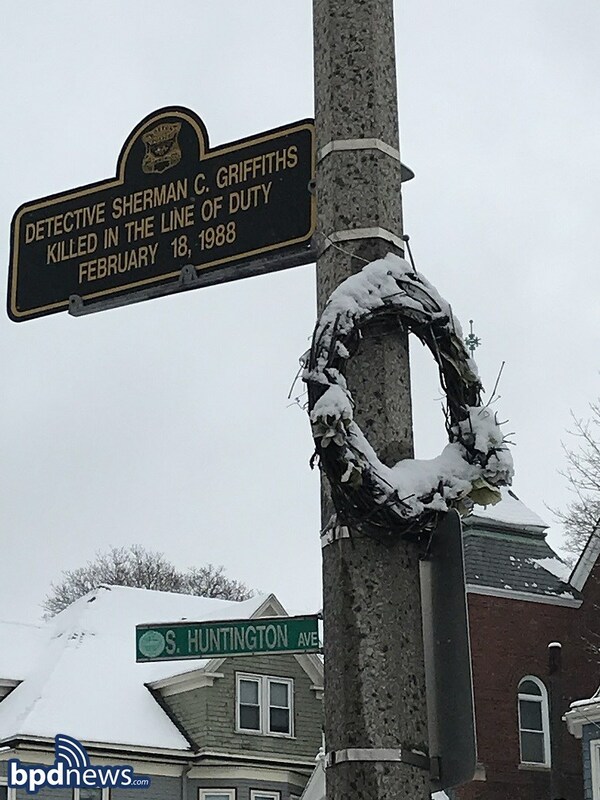 On this day 31 years ago, Boston Police Detective Sherman Griffiths was shot and killed in the line of duty protecting and serving the citizens of our fine city. Detective Sherman Griffiths was shot and killed while serving a narcotic warrant with other officers in the Drug Control Unit. As Detective Griffiths attempted to gain entry, shots were fired from inside of the apartment, he was struck and succumbed to his injuries the next morning. As you go about the course of your day, please stop and take a moment to remember and acknowledge Sherman, his sacrifice, and those who miss him every day. At about 8:40 AM on Friday January 18, 2019, members of the Citywide Drug Control Unit and the District D-4 (South End) Drug Control Unit arrested Hakeem Cooper, 23, of West Roxbury on firearm and drug related charges as part of an investigation in the area of 80 Fenwood Road in Roxbury. Officers executed a search warrant which led to the recovery a loaded .45 caliber Colt handgun along with 21 small plastic bags of crack cocaine and other evidence. As a result, the suspect was placed in custody on scene without incident. It was later revealed that the firearm had previously been reported stolen in Georgia. The suspect will appear in Roxbury District Court on charges of Unlawful Possession of a Firearm, Unlawful Possession of Ammunition, Armed Career Criminal (Level 3), Possession with Intent to Distribute Class B Drugs (2nd and Subsequent), Improper Storage of a Firearm and Receiving Stolen Property. At about 4:50 am on January 15, 2019, as a result of an ongoing drug investigation, the District B2 (Roxbury) Drug Control Unit, City-Wide Drug Control Unit and the Boston Police SWAT team executed two search warrants, one for 5 Cardington Street, apartment.#1 and a second search warrant for the person of Rufus Davis, 52, of Roxbury. The SWAT team made its entry and located Davis, who attempted to flee from a bathroom at which time officers took Davis into custody without incident. Once the apartment was deemed clear and safe the drug unit informed Davis that officers were there with a search warrant for Davis and his apartment. A black Hi Point .45 caliber semi-automatic firearm with black electrical tape on the handle and 7 rounds of .45 caliber ammunition in the magazine. As a result of the execution of the warrants, Davis will be charged with the following: Unlawful Possession of a Firearm, Unlawful Possession of Ammunition, Unlawful Possession Firearm 2nd and Subsequent Violation, Armed Career Criminal Level II, Possession of Class D with Intent to Distribute as well as Possession of Class B with Intent to Distribute Subsequent Offense. At about 9:30 AM on Saturday, December 29, 2018, members of the District E-13 Drug Control Unit (Jamaica Plain), the District B-3 Drug Control Unit (Mattapan) and the Citywide Drug Control Unit executed a search warrant in the area of 280 Hyde Park Avenue in Jamaica Plain. Officers recovered over 44 grams of a Class B substance believed to be cocaine as well as over 10 grams of a substance believed to be Fentanyl, and an undisclosed amount of US Currency. Officers arrested Yamera Borreio, 48-years-old of Jamaica Plain and Carlos Rodriguez, 43-years-old, of Lawrence. At about 7:30 AM on Saturday December 29, 2018, as part of the investigation, officers arrested an additional male, Santos Mercado-Ruiz, 29-years-old, of Roslindale, in the area of 4640 Washington Street in Jamaica Plain. Borreio is charged with Trafficking Class B Drugs, Trafficking Class A Drugs, Possession with Intent to Distribute Class B Drugs Subsequent Offense, and Possession with Intent to Distribute Class A Drugs Subsequent Offense as well as two active warrants for Trafficking Class B Drugs and Violation of the Auto Laws. Rodriguez is charged with six counts of Possession with Intent to Distribute Class A Drugs Subsequent Offense, Trafficking Class b Drugs, Trafficking Class A Drugs, and Possession with Intent to Distribute Class B Drugs Subsequent Offense. Mercado-Ruiz is charged with six counts of Possession with Intent to Distribute Class A Drugs. All are expected to be arraigned in West Roxbury District Court. Investigation Update: At about 12:15 PM on Wednesday November 28, 2018, members of the City-Wide Drug Control Unit and District D-4 Drug Control Unit along with officers assigned to District D-4 (South End) executed a search warrant as part of an investigation in the area of 168 West Springfield Street in Boston. As a result of their search, officers were able to safely recover a loaded .40 caliber Ruger SR40C handgun, 50 bags of crack cocaine weighing 44 grams and 11 bags of marijuana weighing approximately one pound. Officers continued their investigation and returned to the address at about 12:15 PM on Tuesday December 4, 2018, at which time they located and arrested Marybeth Bilodeau, 39, of Boston. At the time of her arrest, the suspect was wanted on outstanding warrants which were issued after the initial search and seizure. The suspect will appear in Boston Municipal Court on charges of Unlawful Possession of a Firearm, Unlawful Possession of Ammunition, Trafficking Class B Drugs and Possession of a Large Capacity Firearm in the Commission of a Felony. INCIDENT #1: At about 12:15 PM on Wednesday November 28, 2018, members of the City-Wide Drug Control Unit and District D-4 Drug Control Unit along with officers assigned to District D-4 (South End) executed a search warrant as part of an investigation in the area of 168 West Springfield Street in Boston. As a result of their search, officers were able to safely recover a loaded .40 caliber Ruger SR40C handgun, 50 bags of crack cocaine weighing 44 grams and 11 bags of marijuana weighing approximately one pound. While on scene, officers identified and arrested Eric Crewe, 34, of Boston, who was wanted on an unrelated warrant sought out of Roxbury District Court for Possession of Class B Drugs. INCIDENT #2: At about 12:27 PM on Wednesday November 28, 2018, members of the Youth Violence Strike Force arrested Brandy Soto, 21, of Dorchester, on firearm and drug related charges after executing a search warrant as part of an investigation in the area of 58 Adams Street in Dorchester. The suspect was placed in custody without incident after officers recovered a loaded 9mm Glock 17 handgun, a loaded 9mm Ruger LC9 handgun, (both with obliterated serial numbers), one large bag and four small bags of cocaine with a total weight of 482 grams, one bag of heroin weighing 61 grams and $6,355.00 in U.S. Currency (See Slideshow Above). The suspect will appear in Dorchester District Court on charges of Unlawful Possession of a Firearm (2 Counts), Unlawful Possession of Ammunition, Possession of a Firearm with an Obliterated Serial Number and Trafficking of Class A and B Drugs. 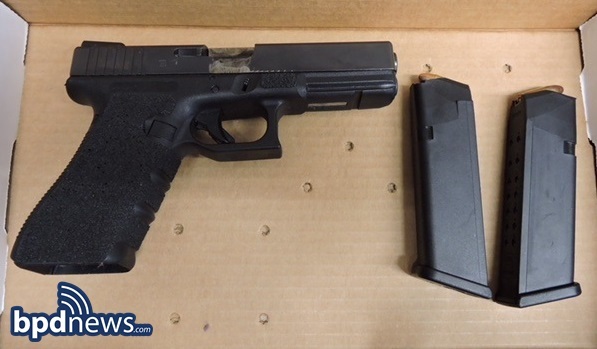 INCIDENT #3: At about 4:38 PM on Wednesday November 28, 2018, members of the District C-11 Drug Control Unit (Dorchester) arrested three suspects while recovering a loaded firearm during a drug investigation in the area of Adams Street and Dorchester Avenue in the Fields Corner area of Dorchester. Officers stopped three males after observing a street level drug transaction. These individuals were later identified as Val Postell, 18, of Plainville, Angel Ortiz, 22, of Dorchester and Michael McCardle, 20, of Everett. While conducting a pat frisk of Postell, officers recovered a loaded 9mm Glock 17 and a plastic bag of heroin from inside a small leather bag which was hanging around the suspect’s neck. The suspect was immediately placed in custody without incident. Officers then arrested the other two suspects, Ortiz and McCardle, on charges of Conspiracy to Violate the Drug Laws. Additionally, officers determined that Angel Ortiz was wanted on a default warrant sought out of Quincy District Court for Shoplifting. Postell will be charged with Unlawful Possession of a Firearm, Unlawful Possession of Ammunition, Possession of a Large Capacity Feeding Device and Possession with Intent to Distribute Class A Drugs and Conspiracy to Violate the Drug Laws. All three suspects will be arraigned in Dorchester District Court. At about 12:15 PM on Wednesday, September 12, 2018, officers assigned to the Citywide Drug Control Unit arrested two males as part of an ongoing investigation in the area of Massachusetts Ave and Albany Street in the South End. As part of the continued efforts to reduce drugs on the streets of Boston, officers arrested Jhonny Gonzalez, 33-years-old, of Boston and Josue Cotto, 39-years-old, of Boston. Gonzalez is charged with Possession with Intent to Distribute Class A Drugs, Distribution of Class A Drugs, and Conspiracy to Violate Drug Laws. Cotto is charged with Distribution of Class A Drugs and Conspiracy to Violate Drug Laws. Further investigation revealed Gonzalez to have multiple warrants for charges including Trafficking 200 Grams of Class A Drugs, Trafficking Cocaine, and Distribution of Class A Drugs. Both suspects are expected to be arraigned in Boston Municipal Court. At about 1:15PM on Monday, September 3, 2018, officers assigned to the C-6 (South Boston) Drug Control Unit made an arrest and recovered drugs in the area of Massachusetts Avenue and Columbia Road. As part of an ongoing drug investigation, officers conducted a traffic stop in the area of Magnolia Street and Quincy Street and were able to locate approximately 22 grams of a substance believed to be Fentanyl. Officers arrested Joel Santiago, 33-years-old of Everett. Santiago was charged with Trafficking Class A.
Santiago will be arraigned in Dorchester District Court. Keeping Boston Safe: Search Warrant Enables Members of the BPD’s Citywide Drug Control Unit to Seize a Gun and Illegal Drugs in Mattapan: Early this morning, on Monday, August 13, 2018, members of the Citywide Neighborhood Drug Control Unit while working in conjunction with BPD’s SWAT Team executed a search warrant that led to the recovery of an illegal firearm and illegal drugs at 41 Hiawatha Road in Mattapan. A search of the location enabled officers to see and take possession of a loaded Glock 22 Gen .40 CAL with an obliterated serial number which officers later learned had been reported stolen out of Atlanta, GA. Officers also confiscated 55 grams of a Class B Drug (Cocaine) and 10 grams of a Class D Drug (Marijuana). Additionally, officers arrested Kaaron Brown, 31, of Boston and charged him with the Unlawful Possession of a Firearm, Unlawful Possession of Ammunition, Trafficking a Class B Drug and Possession with Intent to Distribute a Class D Drug. BPD Officers Hindered from Doing Their Job While Attempting to Apprehend Armed Juvenile in Roxbury: On Thursday, August 2, 2018, officers assigned to the City Wide Drug Control Unit were conducting directed patrol in the area of 2 Estabrook Road in Roxbury while attempting to serve a search warrant in connection to an ongoing firearm investigation on a juvenile male living in the neighborhood. While surveilling the area, officers observed the male in question exit the above-mentioned location while in the company of a second juvenile male. Officers soon noted that one of the juveniles appeared to be nervous, looking around anxiously, while clutching and holding a backpack close to his body. Officers observed both individuals walk a short distance before ducking into the Dewitt Community Center located at 122 Dewitt Drive. Following behind the individuals, officers were buzzed into the community center after identifying themselves as police officers. Once inside, officers quickly asked the front desk staffer to help them in locating the two suspects. After being directed to an upstairs classroom, officers located and observed both suspects sitting in the classroom. After alerting the proctor of their intentions, the officers waited in the hallway as the suspects made their way towards them. However, as soon as the suspects exited the classroom, both attempted to flee the scene while pushing and physically assaulting the officers. While one of the suspects was subdued in the hallway, the other suspect bolted towards the stairwell leading to the first-floor exit. As the second officer gave chase and attempted to apprehend the suspect, a physical altercation ensued causing both the officer and suspect to tumble and fall down the stairs leading to the first floor. As the officer struggled to subdue and maintain control of the suspect, the suspect repeatedly kicked the officer in the face and upper body. As the altercation spilled into the main lobby of the building, responding officers, forced to watch the altercation through the community center’s glass doors, were unable to gain entry and provide support to the struggling officer because a front desk staffer refused to let them in. Eventually, officers did gain entry and were able to help subdue the suspect. A search of the suspect’s backpack enabled officers to see and seize a loaded firearm described as a Chiappa .22 caliber Revolver (See photo). When asked to explain the delay in allowing responding officers to enter the building, the front desk staffer stated that she had been reprimanded by a supervisor who took issue with her decision to allow officers inside building in the first place. Dismayed and disillusioned by the explanation, officers promptly explained to the staffer that a search warrant isn’t a suggestion or topic for discussion, but rather a court order that gives police officers the authority and authorization to conduct a search of a person regardless of location. Two officers were transported from the scene and treated for non-life threatening injuries at an area hospital. Officers arrested a 16-year-old juvenile from Boston and charged him with Unlawful Possession of a Firearm, Unlawful Possession of Ammunition, Carrying a Firearm on a Public Way, Assault & Battery on a Police Officer and Resisting Arrest. Officers arrested a 15-year-old juvenile from Boston and charged him with Assault & Battery on a Police Officer and Interfering with Police Officers.